A diary (of sorts) of foods I've prepared (and want to keep record of) as shown by crappy photos. I hate when he's not feeling 100%. The mommy guilt is at an all time high whenever that happens. I should be at home taking care of my baby but mommy has to work. To help put food on the table. It blows. And then there's the "oh if only I made those special soups for him everyday like mom did for us then he'd have a better immune system and wouldn't get sick". But I'm too tired and drained from work to do it everyday. I dunno how single moms do it seriously. Hubby is great and helps out so much but it's still so much taking care of K. Kudos to all you moms out there. Anywho, K is sick so I made some plain congee for him in the morning before I left for work. I cheated and ground up the rice before cooking it so it would cook at a fraction of the time it normally does. Thank god cuz it normally takes hours to get it to the consistency where he wouldn't spit it all out. Rinse rice a couple of times and then grind it in a small blender, or spice grinder. It will be like a white paste. Add to a small pot. Use some of the stock to swish out the rest of the rice. Pour in the remaining stock and stir in the tenderloin & ginger. Partially cover and bring to a low simmer. 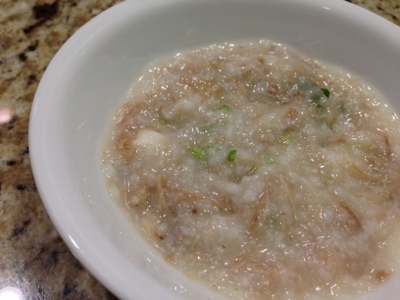 Simmer on the lowest heat for 30 minutes for a thin congee or 45 minutes for a thicker congee. Stir in green onions and season with salt to taste. Make sure you remove the ginger before serving. The trick to making congee not stick to the bottom of the pot is to not move anything in the pot after the rice is put in and liquid is heating up and to make sure you're using the lowest heat possible to avoid any burning. If you move the rice once it's been heated, then you'll have to stir it very often while it's cooking to keep the bottom from sticking.